I Love You Veggie Much! Hi, Heffy Doodle friends! It’s Cassie, back today with another card to share with you! 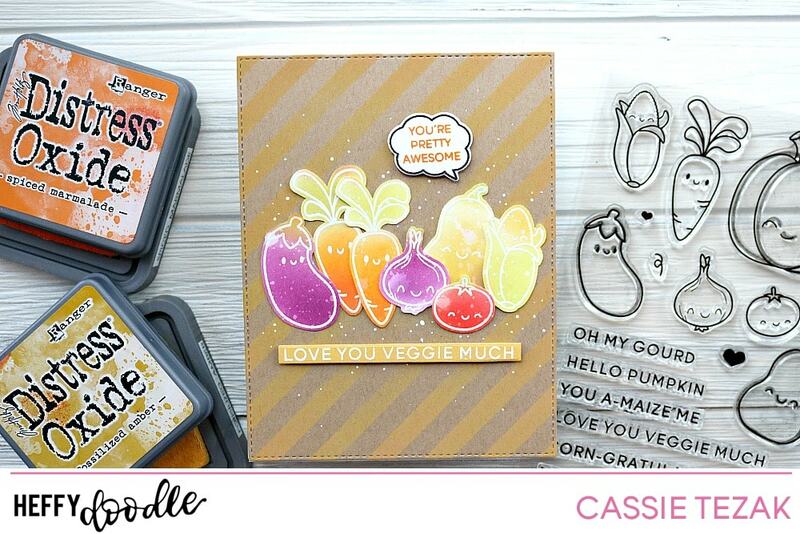 It feels like forever since I’ve been on the Heffy Doodle blog, so I’m excited to share what I’ve got for you today 🙂 I’m using a bunch of the new release 5 products for this card that I think would be perfect for anyone that you want to let know you care for them! Let’s jump in. 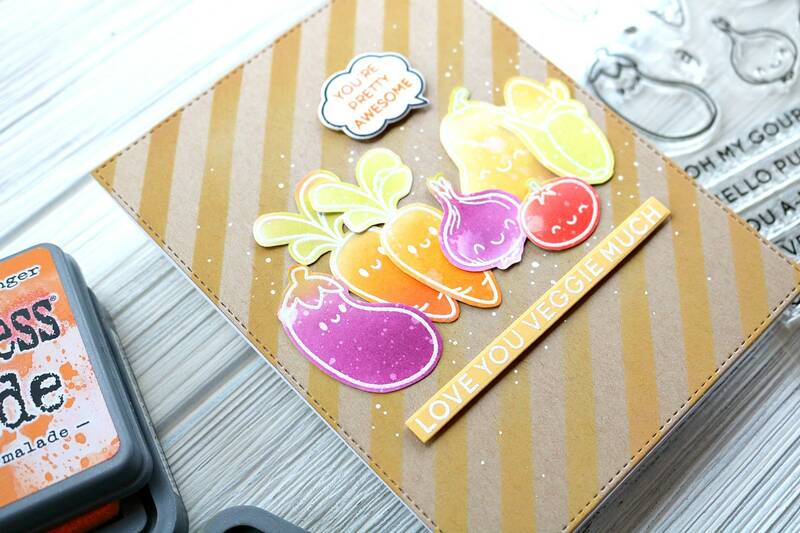 I started the card today by stamping out a bunch of the vegetables from Veggie Patch stamp set with VersaMark ink and heat embossing them with a detailed white embossing powder. Once they cooled I took my Distress Oxides and ink blended them with different colors to look like they normally do. I spritzed them with a little water to give them a splattered look and die cut them out with coordinating dies. While I had the embossing stuff out I also white heat embossed a sentiment from the set on some yellow cardstock and cut it out with the smallest Stripes of Ease die. Next I die cut the largest rectangle from the Imperial Stitched Rectangle die set and grabbed the Candy Store stencil for some ink blending. I used Fossilized Amber to ink blend the stripes on. I love the way this looks over kraft card stock! Distress Oxides are such magical inks 🙂 Next I arranged the vegetables on the card how I wanted them, adhering them down with some adhesive. I adhered the sentiment with some foam tape, and decided it needed a little something extra. So I stamped out the speech bubble and sentiment from Whatcha Sayin’ Now and popped it on with foam tape as well. 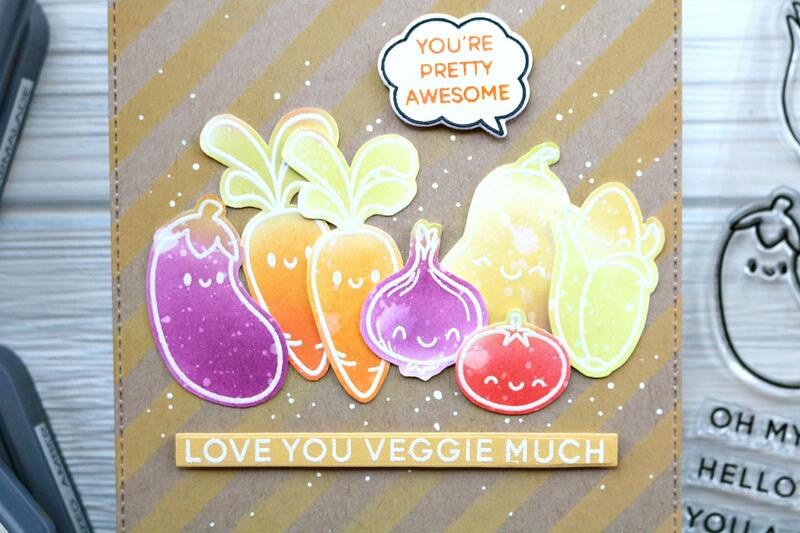 To finish off the card I added some white gel pen dots around the veggies. I had wanted to do some ink splatter by I didn’t want to risk getting it where I didn’t want it, since the card was pretty much complete at this point. This was a perfect alternative! And that’s it for my card today! I hope you enjoyed it. Thank you so much for stopping by, and I’ll see you again soon!